Safely store and transport 11" & 12" slicing and 12" chef's knives, among other 11"-12" knives, with the Mercer Culinary M33114P 12" x 2" blade guard! Made of black polypropylene, this simple yet effective edge protector ensures the fine blades of your knives stay sharp and in perfect condition. I put this guard on my water melon knife and my king salmon knife and it fits perfect. I would recomend anyone to buy these guards. They fit snug on any knife. They’re good for safely storing knifes. I was surprised and delighted that the design has been changed and improved; the angled hilt end makes this knife edge guard more functional. It was easy enough to slide my Mercer Culinary Millennia 11-inch bread knife into this 12"×2" edge protector. I really like this design knife guard. The guard is a hard plastic with a felt-like inside to keep the integrity of your knife. This is a great and affordable way to add some safety in to your kitchen. Mercer Culinary Blade Guards are exceptionally useful, and very inexpensive as well. This 12" x 2" version works great for longer slicing and granton knives. These are so great, I wish Mercer would make 14" blade guards for even longer slicing/granton knives too. This is a high quality blade guard. It will not rip easily and the knife fits well into it. The knife stays put during travel. The price is excellent for the quality. If you are buying a slicer or any long blades, spend a few extra dollars and order the blade guard. I found this same blade guard at other stores at 3-4 times the price. Great for storing your knives in the drawer and transporting them to relatives who don't own a sharp knife. Avoid accidental cuts and slices with these guards. A nice, quick and easy blade guard. I use this specifically for my 11" Serrated Slicer and it always stays in place to and from work. I've tried many different types of blade guards, from sleeves to sayas to clamshell closures to magnetic closures. This Mercer blade guard is the simplest, the easiest to use, the most durable, and in my opinion, the most effective. The fact that it's also the least expensive was not part of the purchasing decision, but it doesn't hurt. These blade guards are great for transporting knives in a knife roll or knife case, and also excellent for those who keep their knives in a drawer. They protect the blade, and also provide an added measure of safety. At this price, it's hard to go wrong. Another excellent product from Mercer Culinary. This is our longest, most used blade so its important that we keep it safe. Protecting your knife makes sure they are safely stored and can improve the life of your blade. It also helps prevent injuries from accidental grabbibg of the blade. Great guards: I have many in different sizes and Webstaurant has the best prices on them. Easy to use, effective, and I've only managed to break one of the little 6 x 1's after hard usage all these years. Highly recommended. A must have for protection! Carver knives are not safe to be left out unsheathed. I recommmend wearing a cut resistance glove when inserting as an extra precaution. I purchased the Mercer M33114P 12" x 2" Polypropylene Blade Guard (Item #: 470M33114P MFR #: M33114P) to use in culinary school. The cover fits my 12-inch Mercer bread knife perfectly. It slips on easily, stays in place. A must-have if knives are stored in a knife bag or drawer. Excellent value for the money. This blade guard is one of the best I have ever purchased. It held up well and insured that no one would get hurt in my knife droor. I bought this for my 12" slicer and it works like it is supposed it. It is a nice strong thick plastic that hugs a blade without touching the sharp edge so it is secure in its housing. I have had a knife that is too long for a knife block and to protect it I made a rather ugly cardboard blade protector. Sure it worked, but it was something that I preferred not to have. Locally I could not find a blade protector for that size or one that was worth the expense. Webstaurant had one that fit my blade and was pretty cheap so I gave it a chance. It fits my knife and stays on even when i shook the knife a few times(Don't try that at home) and seems to be fairly sturdy. Would buy again if I need to protect the blades of future knives that don't fit. I may get the smaller version for a cleaver to see if that fits. I bought this to cover the knives at my church kitchen with hopes that the staff there can keep them sharp longer than two days (ugh). They're stored in drawers and these covers help keep fingers safe and protect the knives from clashing against each other in storage. They have a tight grip on the blade and work exactly as expected. I would recommend this product. Protecting your knives edge is important, this is two fold - (1) safety and (2) ensuring that after you spend time sharpening you knives they stay that way. The Mercer blade guard fits the bill every time. Just by looking at this blade guard, I knew right away that it offers a look of high quality and durability. This is exactly what I needed to complement my appearance of a professional chef during my catered events. I am very pleased. Used the Mercer M33114P 12" x 2" Polypropylene Blade Guard on my Dexter-Russell 29353 V-Lo 12" Scalloped Roast Slicing Knife. This knife is also sold through webstaurant. Very happy with the guard. I got this one blade guard because I no longer have a knife magnet and must keep my knives in a drawer which is disastrous, for my fingers and for the knives. When I place my next order I will be ordering several more, they work much better than the paper and cardboard ones that I had fashioned for my blade guards. Love these! perfect for keeping fingers from bleeding and blades from dulling. use this on our victorinox knives as well as some other expensive knives. as long as you get the right size it will fit pretty much any knife. having these on no more fear of leaving knives in a drawer both for safety and easy of access use. These are fairly easy to use and it's nice that they are slightly harder to pull off. I can definitely recommend these to protect your knives. Good product. great for the price. fit for both way. no worry when you carry. alway buy this for my knife. do the math before you buy it. This 12x2" knife guard is perfect for my 12" Mercer Millennia bread knife. The blade fits comfortably in the guard without bending the hard plastic and stressing it out. These mercer blade guards really to come in handy and are a great wat to protect your knives. Prevents knives from banging together. Graet price too!!! Great knife guard! Holds your knife securely and it will not slip off by accident. I purchased this 12 x 2 knife guard for my Dexter 12" traditional butcher knife and it works perfectly. Recently bought a 10" semitar from Webstaurant and forgot (actually never even thought about it,lol) to purchase a holder. What a pain in the rear that turned out to be, had to store it in the shipping package. Ordered this product and I am very pleased with it. Strong and ridged yet easy to remove and slip the very,very sharp knife in the holder. Protect yourself and your investment, get one. 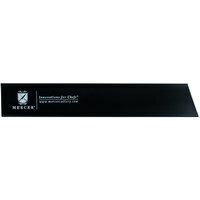 The Mercer M33114P 12" x 2" Poly Blade Guard works as described. I had to use the 6" x 1" guard with it on my Victorinox Cimeter due to the curve of the blade. But between the two there is good coverage to protect the blade, the case, and the fingers. This product does exactly what you expect a blade guard to do. It is sturdy and you won't have to worry about someone getting cut on the knife while it is in this heavy duty plastic protector. I purchased this to protect my Victorinox slicing knife. That delicate looking knife is extremely sharp. This guard protects the slicing edge, as well as my hands since I store this large knife in a drawer. A must buy item for any of your knives in the kitchen. This particular one is great for the 12 in. sashmi knife from Mercer. One of many great products from Mercer! Based on other reviews, I picked this up for the 12" Victorinox slicing knife. It works perfectly for that knife. I was impressed at the thickness if the plastic and how sturdy it felt, considering the great price. This Sleave is more then perfect to keep yourself safe away from cutting your hands or fingers when you open your knife pouch. Definitely a must! These blade guards are a must when transporting your knives. Also great for those knives you own that won't fit in your knife block, you can store in a drawer without having the edge exposed. I wish you carried more sizes. These will last a lifetime. This is a good cover for longer blades. It easily slides over the blade to prevent nicks and scratches during travel. I use it to protect my knifes in my knife bag. These knife guards are a must have for prolonging the life of your knives!! They are easy to slip on and keep the blade sharp during storage!!! I bought a set of these along with my Mercer set and I have been diligent about making sure my employees use them. This set protects my blades very well!